By hiring a professional Close Up Magician to perform at your event is a fantastic icebreaker; even the most unlikely groups will find it impossible not to comment and make conversation around the table, making your event unforgettable! Martin’s close up magic is a culmination of sleight of hand skills and comedy. His performance will not interrupt the flow of your event and is an excellent way to celebrate in style whether it’s at your Wedding, Corporate Event, Trade Show or Private Party. When planning your wedding you may be looking to entertain your guests in a unique way, something different that your guest’s will remember. Something that’s a little more than just a Wedding Band, or a Wedding Singer – you can now have the Wedding Magician! This is the most popular time to have Magic on your special day, and also the most successful. Having Close-Up Magic between courses is a fantastic way to make the long meal time more entertaining. Martin can entertain each table with unique Close-Up Magic complimented by humour and comedy putting any audience at ease. Martin’s intimate style will not interrupt the flow of your Wedding Breakfast and is an excellent ‘ice-breaker’ with Wedding Guests who have never met before. The taking of photographs during your Wedding day can feel like a long time especially for those guests who are not participating in the photos! Martin can entertain with Close-Up Magic by mingling and walking around entertaining your guest ensuring a relaxed and enjoyable atmosphere is experience by all whilst they are waiting. As the early evening reception begins have Martin mix ‘n’ mingle with your guests helping the evening festivities go with a bang! This type of entertainment is best early on in the evening before too many drinks have been drunk and the DJ is in full swing. Whether your exhibition stand is for public relations or to gain new leads and clients, having a Magician at your Trade Show puts you above the competition. Martin will create interest for your stand and ensure that you attract the potential clients that you require by increasing your profile and company awareness. If you are having a Corporate Event such as an End of Project Treat, Summer Ball or Christmas Party why not hire Magician Martin Scarborough as an alternative to a singer or caricaturist. Martin can perform Magic whilst mix ‘n’ mingling during the Drinks Reception before your guests are seated and then between courses – this is a fantastic way to make meal time more entertaining. 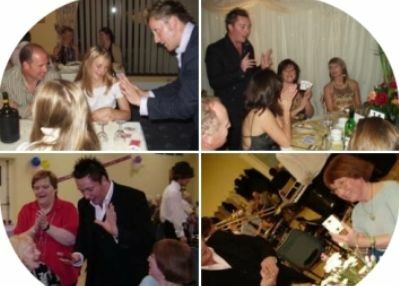 Martin can entertain each table with unique Close-Up Magic complimented by humour and comedy putting any audience at ease and making your function memorable. Martin’s intimate style will not interrupt the flow of your event and is an excellent way to celebrate in style! It’s difficult to determine exactly why people return to a restaurant or bar on a regular basis. Is it because they like the food? Or that they enjoy the environment? Or is it the level of service? What makes your restaurant or bar successful and head and shoulders above the rest? It’s been proven that by providing tableside entertainment, customers are more likely to return as they will cast a more favourable eye on a restaurant that offers more for their money than just food, drink and service! It’s this little something extra that will make you standout from the rest of the competition and encourage business growth and reputation!